Thomas Hearns and Sugar Ray Leonard mix it up during their welterweight championship fight at Caesars Palace on September 16, 1981. On the night of September 16, 1981, the biggest and most anticipated welterweight championship bout in boxing history was contested. In addition to that the participants, WBC champ Sugar Ray Leonard 30-1 (21) and WBA champ Thomas Hearns 32-0 (30), rank among the five greatest welterweight champions ever—and that’s based on their careers and how both would’ve fared head-to-head versus the other all-time great welterweights. From a stylistic and strategic vantage point, both Leonard and Hearns rank as two of the most difficult fighters to attack and neutralize in recent memory because of their versatility. And more often than not, to beat them you needed a certain amount of God-given physicality. The only fighter to beat Leonard during his prime was the legendary Roberto Duran (on one of his best nights), and the only fighters to beat Hearns in his prime were Leonard and Marvin Hagler who were also in their prime—and that speaks to the conundrums both Ray and Thomas presented their opponents in the ring. By the time Leonard and Hearns met, in a fight titled “The Showdown,” both had shown they were special, and clearly on their way to achieving status as all-time greats. Leonard won the WBC title with a fifteenth-round TKO of undefeated Wilfred “Radar” Benitez, who made Leonard miss more punches in fifteen rounds than he had in his previous twenty-five bouts. He made one title defense, and then lost it and won it back from Duran. And it was those two fights—twenty-three rounds fighting Duran—in which Ray went from being a college graduate to earning his doctorate. Specifically, the Duran fights, especially the first when Duran dictated the terms of the bout, changed Leonard physically and transformed him from a young adult into full-fledged man. In Hearns’s case, he was a welterweight with the height, reach, and punching power of a light heavyweight. When he met hard-punching WBA champ Pipino Cuevas, Cuevas was making his twelfth consecutive defense and had stopped every challenger except Randy Shields—and, other than in his pro debut, he had never been stopped. Yet Cuevas was no match for Hearns, who measured him with his left jab and blasted him out in the second round with a straight right that landed like a missile. And after making three successful defenses of his WBA title, the stage was set for the “Showdown” with Leonard. The prevailing view going into Leonard-Hearns was that Leonard was the elite boxer and he could never beat Hearns fighting it out. Conversely, Hearns was seen as the destroyer who lacked the ability to outbox Leonard. Little did anyone know there would be three fights in one over the course of fourteen rounds. The fight started as most had anticipated, with Leonard using the ring and circling and trying to get a read on Hearns’s range, strength, and technical flaws (if there were any). But what he found was that there were no gaps in Hearns’s game. Thomas, using his massive 78-inch reach, threw his jabs straight out, aiming for Leonard’s chin and chest to ensure there was no variation. He also recoiled his jab back quickly and into position to counter or cut loose with it again. In addition to that, Hearns wasn’t trying to kill Leonard with his right hand and was content to push the fight, edging each round as Leonard was stuck outside searching for an answer. Hearns, even with his low left hand, was out-jabbing Leonard to the head and body; and he was also making Ray miss when Ray attempted a surprise attack hoping to use his hand speed. 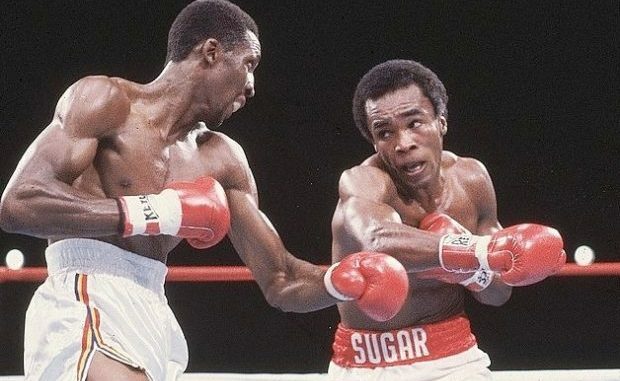 Through the first five rounds, Sugar Ray Leonard’s brilliant offense was rendered ineffective and stymied. Then, with about a minute left in the sixth round, Leonard, using lateral movement, countered a Hearns miss while getting inside with a right hand and left uppercut that shook Hearns visibly. And, like a shark, Leonard smelled blood in the water and went for the finish and rocked Hearns again—but he was also stunned by a Hearns left hook to the body, followed by a right to the chin. The sixth round would prove to be the turning point of the fight. And starting in the seventh, the fighters switched roles and Leonard became the predator and Hearns the prey. Leonard began the seventh going in behind his jab looking to shoot right hands over Hearns’s low left hand. Hearns was now giving ground but he was still whacking Leonard pretty hard with left hooks to the body. But Hearns wasn’t moving enough, and was at times laying with Leonard on the inside, and Ray got off faster and rocked Hearns with uppercuts to the chin along with a few hooks. Starting in the eighth, Hearns emulated Muhammad Ali and got up on his toes as he bounced to the left and fired out stinging left jabs. At the same time, Leonard did his best Joe Frazier imitation, but he wasn’t as effective getting underneath Tommy’s long-range potshotting. As the rounds progressed two things became obvious. The first was that Thomas Hearns was a much better, and more sophisticated, boxer than he’d ever been given credit for—as he was changing direction on the fly and timing Leonard, catching him on the way in with leads from both sides. And the second thing was that Ray Leonard showed he could really take a punch. And because of this, he walked to Hearns with no head movement, upright, trying to induce Hearns to throw first so he’d have a brief window to counter. Shockingly, the puncher was out-boxing the boxer, and the boxer was in pursuit looking to turn the fight again with a single shot. Yes, Leonard was the aggressor, but as it was when Hearns was pushing the fight, Leonard seemed a little bewildered trying find the now-elusive Hearns. In the eleventh round, Hearns started to stop and plant as he was nailing Leonard with straight lefts and rights; while Ray was trying to ignite something on the inside, but just couldn’t get there. In the twelfth, and realizing he was losing trying to push the fight, Leonard went back to using the ring to lure Hearns to again push the fight—and Hearns obliged. But Leonard never got the opportunity to counter Hearns because of Hearns’s left jab. Before the start of the thirteenth round, Angelo Dundee said to Leonard, “You only got nine minutes left.” And with that, the fear of losing the most anticipated welterweight title bout in history sunk in and Ray realized there was no boxing Hearns, and to win the fight he had to stop Hearns, overwhelming him with his speed and his full arsenal of punches and combinations. And then he started going in behind his quick jab—but instead of pulling out, he stayed close and whacked Hearns more to the body. This made Tommy drop his hands a little, and then Ray went back to the head and scored. Then, after a clinch, Leonard rocked Hearns with a right hand that momentarily froze him. Leonard, seeing Hearns was hurt, pounced and began to fight as the alpha predator again, and it was sapping Hearns’s confidence. With a minute left in the round, Leonard punched Hearns between the ropes and suddenly the thought of winning the fight was real again and his confidence soared. And with around ten seconds left in the round, Leonard’s all-out attack forced Hearns through the ropes again, which was ruled a knockdown as Leonard celebrated, raising his hands in the air as the bell rang. When the fourteenth round started, Leonard was trailing on all three judges’ scorecards and needed two big rounds or a stoppage to win a fight in which Hearns proved to be the better fighter for thirteen rounds. At the sound of the bell, Leonard ran out of his corner to get at the tiring and less-confident Hearns. He let Hearns open the round punching, but that was to give Tommy false hope so he’d open up—and he did, but not with enough conviction to get Leonard to back off. Leonard stayed close; and in doing that, he pressured Hearns to let his hands go. And that’s what Leonard needed: a small gap to punch in between Hearns’s shots and force the fight inside, where he held all the advantages. The strategy paid off because Leonard got closer and landed a looping overhand right that hurt Hearns and rendered him nearly defenseless. Now, with Hearns unable to fight back, and not experienced enough to clinch and hold, Leonard ripped him inside to the head and body and back up to the head. And with Hearns offering little or nothing in return, referee Davey Pearl stepped in and halted one of the most thrilling and action-packed title bouts in history. In re-watching the fight, it’s clear that both Leonard and Hearns are even greater than previously thought. In Hearns, you had a fighter who won with unmatched power and who was capable of delivering it against any opponent and style. Against Leonard, he showed he could box—and do so on the move—not to mention showing that he could dig down to win rounds when it looked like Leonard couldn’t be deterred. As for Leonard, he may be the most versatile fighter of the last fifty years. There’s nothing he couldn’t do. He’s the perfect fighter in that if his opponent wants to box, he has the speed, power, toughness, and intuition to make them fight against their strengths. And if the opponent wants to go to war, Leonard has the capacity to box them and fight them on his terms—and, man, could he smell blood and finish once he sensed an opponent had the slightest bit of self-doubt. Leonard and Hearns are two of the greatest of the all-time greats and were chameleons in the ring. And beating Hearns in “The Showdown” underscores Leonard’s greatness more than any other victory. And the versatility both men showed at the peak of their abilities proved they would always have competitive fights against each other, with lots of potential twists and turns. Frank Lotierzo is also a staff writer for NY Fights. Over the years, his work has appeared in The Sweet Science, Boxing Illustrated, Fight Game, and Boxing Scene. In the late 1970s and early 1980s, he was an amateur boxer based out of Philadelphia and trained by George Benton. 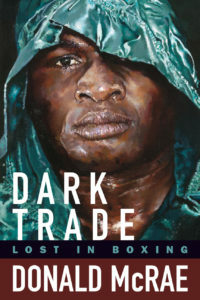 He is a member of the International Boxing research Organization and an ex-member of the Boxing Writers Association of America. He can be reached at glovedfist@gmail.com.